Leaf peepers, you drive me crazy! Seriously though, I used to live up Big Cottonwood Canyon, and from mid September into early October every time I’d drive home from work or leave my house to go to the grocery store it was like I belonged to a circus caravan of photographers that never pulled over for me to pass. However, now that I live in the city again, I’m finally ready to betray my old neighbors and publicly admit that I, Ann Gates Weaver, am a leaf peeper, and that Big Cottonwood is indeed spectacular. 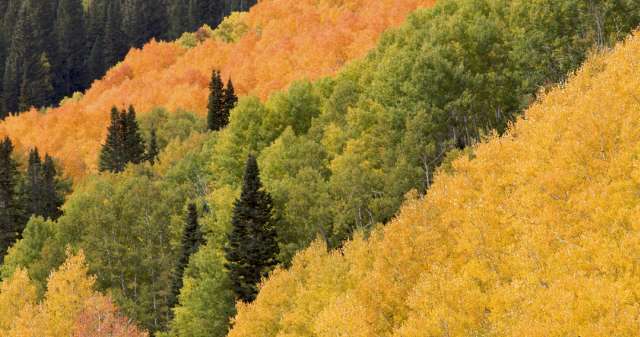 Aside from Big Cottonwood, several other areas are solid bets for breathtaking fall foliage. Find out where the best places to see the leaves are.